MSV: Stick makes it official! Anthony "Stick" Romano, the current county legislator freeholder and former BoE trustee and Hoboken Police Captain made it official today, he's running for Hoboken mayor. 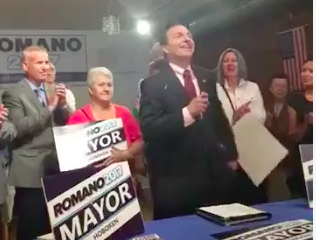 After last week's stunning reversal where Mayor Zimmer dropped out of the race, the floodgates have been opened and as expected Romano becomes another major candidate to compete for the office. Romano made an impassioned and emotional appeal in his remarks earlier today speaking of his connection to the community and acting as a link between government and the people. Talking Ed Note: On hand for Romano's announcement were friends, family, campaign supporter and former Hoboken first ward councilwoman Terry Castellano. No Hudson County officials expected however made an appearance. The Hudson County View filed this report.